The legislature is in session and there is a natural concern about policy in the state, and hopefully even greater concerns about the data employed to make the policy decisions. With the first round boom in the state’s oil industry over there are now significant discussions about the path forward. Obvious questions include: what is the likelihood of eventual recovery in the industry? How will an oil recovery impact the larger economy? These are great questions to ask (and there are many more), though they are actually quite complex to answer. Let’s consider some recent population data released by the U.S. Census Bureau. 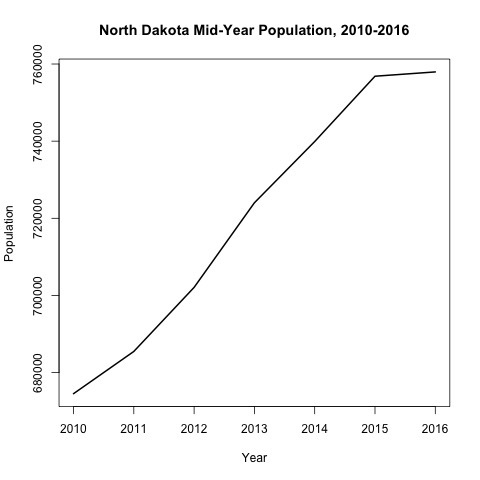 The circumstances of North Dakota’s population changes are well-known over the past few years and can be seen in the graph below. In particular, the declining slope of the curve at the end of the time frame is the current concern. Actually population concerns may not be the current question, but it likely would be. There are many fundamental economic questions being asked right now, and policy solutions being formulated, that create an intense need to better understand aspects of the recent population dynamics in North Dakota. As of the middle of the year the population continued to grow, though clearly the pace of increased declined. At one level this is natural of populations as they increase, the percentage changes declines. There is a part of this that should concern people considering policy decisions. North Dakota lot over 6,000 people to other states in a significant net out-migration. There was a net in-migration on the foreign side of almost 1,600. The rest of the population increase of 1,117 came from natural increase (births – deaths) of 5,652. Why should the loss of 6,259 people be of concern? Let’s try to give this some scale. The domestic out-migration is equal to 7.5% of the total population change in North Dakota from 2010 to 2016. That type of decline can lead to overall population decrease quickly. Of further concern is the cause of the population loss. What are the cause of the decrease? In all likelihood we should be looking at two factors, and they are related. The first is the decline in the oil industry. There were job declines and in many cases departure was a good scenario given a lack of family formation or other factors to make staying more palatable. The oil industry decline led to our second cause, the decline in the state economy as a whole due to knock-on effects from oil. These were not uniform across industry or the state, but clearly mattered for factors such as the state budget, which likely served as a great transmission mechanism for the decline across the entire state. Population is a key factor for North Dakota, and any economy, to understand when talking about growth and development. This is even more the case when we are talking about a state tackling budget deficits and population is also declining. Expect more discussion of this here, and hopefully around the state.